Choice Streets attendees line up at the Solber Pupusa food truck. 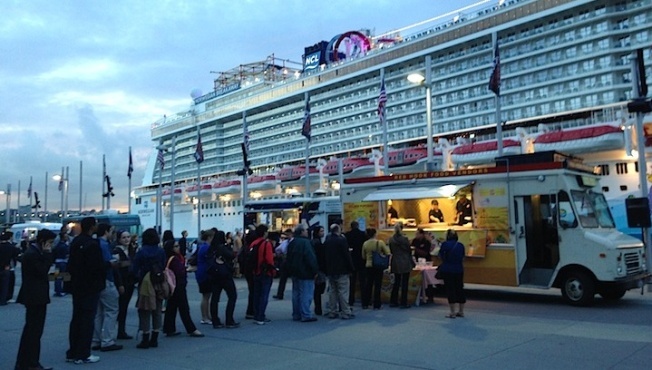 Last night, Village Voice threw their 2nd annual food truck event Choice Streets on Pier 86 at the Intrepid. What better way to spend a beautiful spring evening than to get a taste of some of the city's best street eats right next to the famous USS Intrepid. Red Hook Street Vendors' Solber Pupusas, serving up pupusas, a hot corn tortilla filled with meat (or cheese). A Bufala slice at Neapolitan Pizza. Souvlaki GR charcoal grilled chicken with Souvlaki sticks and hand-cut Greek fries. Chef Samir's lemon chicken couscous at Come Ci Comme Ca. A delightfully surprising amount of vegetarian options like the veggie flautas. There was no shortage of dessert trucks, like Wafels & Dinges, serving up hot Belgian waffles. Attendees feasted while the sun set over Pier 86.